The magazine’s series of sponsored e-books continues with a look at the barriers against air leakage in a variety of building assemblies. Successful independent field-testing and code compliance analysis in British Columbia has led to the continent’s first comprehensive set of residential construction details for insulating concrete forms (ICFs). From footings to trusses, the ICF details presented in the provincial Homeowner Protection Office (HPO) release, “Building Envelope Guide for Houses,” offer a concise and cost-effective path to best practices and B.C. code compliance. Ongoing efforts indicate a strong potential for expanded adoption of these details in jurisdictions across the country. Many different methods—and even more opinions—exist on weatherproofing ICF walls. Only recently has the industry had scientific evidence upon which to base best practices for installation of window and door openings in such walls. “ICF Field Testing Report,” a research report issued by HPO, provides a range of solutions compliant with building codes. These solutions address the widest-possible range of building types, from single-family homes to high-rise commercial buildings. To convey the report’s findings and make them easily applicable to individual projects, it is best to start at the core of the issue—how to permanently prevent air and water leakage at window and door openings in ICF walls. A recent Construction Canada feature examines this topic. 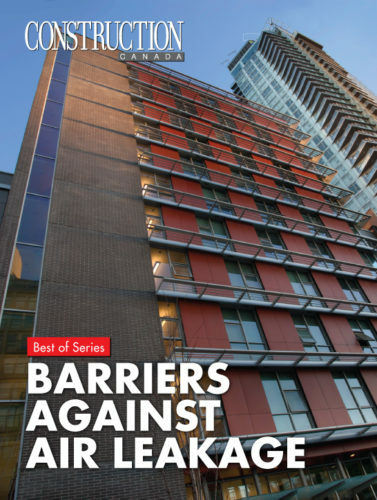 To learn more about the research, along with other strategies for blocking the escape or entry of air, you can download the new, free Construction Canada e-book, “Barriers Against Air Leakage” at https://www.constructioncanada.net/download-the-new-free-e-book-on-barriers-against-air-leakage.